Boy, everyone is really trying to distance themselves from Aaron Hernandez, huh? 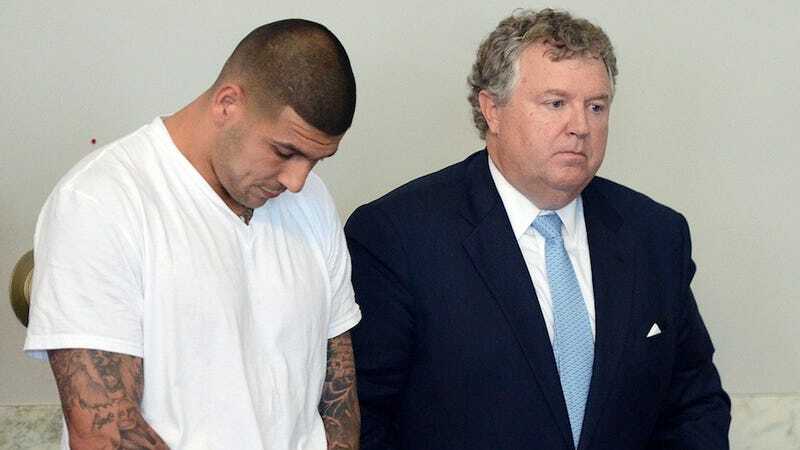 The bosses at Muscle Milk called off their deal with Hernandez late last week; the Patriots ended things with Hernandez early Wednesday morning; and, earlier today, Puma, the German manufacturer of footwear and all kinds of other athletic goodies, terminated its agreement with Hernandez. A Puma spokesperson told MassLive, "[We] have ended the relationship with athlete Aaron Hernandez in light of the current situation." (Nice of them to clarify which one. All the other Aaron Hernandezes can rest easy... for now.) Anyway, where were we? "The current situation." Right. What a situation! Hernandez stands accused of masterminding the execution of 27-year-old Odin Lloyd. And Puma would never dare associate itself with someone who masterminded executions. Right? [Adi and Rudolf Dassler] both became members of the Nazi party and signed their letters with 'Heil Hitler', but they began to argue over politics. They later split up. Adi called his business Adidas—a combination of Adi and Dassler—while Rudolf tried Ruda before plumping for the sleeker Puma. There you go. That little Nazi grew up to found Puma, which would one day employ Aaron Hernandez. And now you know ... the rest of the story.